A football coaching program run by a former professional player is planning to set up a regular presence in the Scottish Borders this year. Box Soccer Training (BST) has been offering training mostly in and around Edinburgh, Stirling and Dundee – seeing the likes of Ryan Gauld and John Soutter come through their ranks at a young age – and is setting up coaching camps in the Borders this Spring. John Colquhoun is involved in BST. He played professionally in Scotland and England for 19 years. He played for Stirling Albion, Celtic, Millwall, Sunderland, St Johnstone and most notably Hearts – where he made 345 appearances over two spells at the club. He also earned two international caps for Scotland. He said: “There’s a lot of talent in the Borders, for example John Collins came from there, and it’s a shame that some of them have to travel for an hour or an hour-and-a-half to get some really get training. Workshops are set for Tweedbank, Jedburgh, Lauder, Galashiels, Peebles, Hawick, and John said they are looking to set up a “regular presence” in the area if the demand is there. “I think there’s a lo of talent that rugby is stealing away and I think football has to do more,” he added. They have already been putting their foot in the door with a series of sessions at Tweedbank recently. BST is looking for people interested in becoming coaches in the Borders to come forward and contact them via their website www.boxsoccertraining.com. He noted that they have some young coaches – as young as 18 years old – and that you don’t need to have professional football experience to be one, but “you just need to demonstrate the right attitude”. And Box Soccer Scotland works with the Scottish Football Association so young players can progress to the next level, such as when Gauld moved on to the Dundee United youth system. 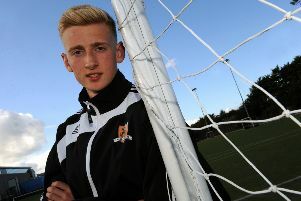 Colquhoun added that the Borders is a “huge area so we want to give youngsters there a chance”.